Senate Finance Committee Chair Chuck Grassley (R-Iowa) has revived his oversight push on not-for-profit hospitals to make sure they offer enough charity care to justify their tax-exempt status. In a letter sent last week to Charles Rettig, the head of the Internal Revenue Service, Grassley homed in on tax-exempt hospitals' debt-collection practices—particularly for poor patients who might qualify for financial help—and asked how many not-for-profits aren't publicizing their financial assistance policies widely enough for the poor patients to know they can get assistance. He also expressed concern about the trend—which the IRS reported to Congress last May—of mounting unreimbursed Medicaid costs as charity care expenses decline. According to the agency, Medicaid expenses grew 20.6% from 2011 through 2014, while hospital charity care decreased by 16.5% in the same time frame. The letter heralded a warning note about harsh billing practices—just as congressional lawmakers work on a policy to end surprise medical billing. The senator suggested he will leverage his Finance Committee chairmanship to make sure hospitals are playing fair. 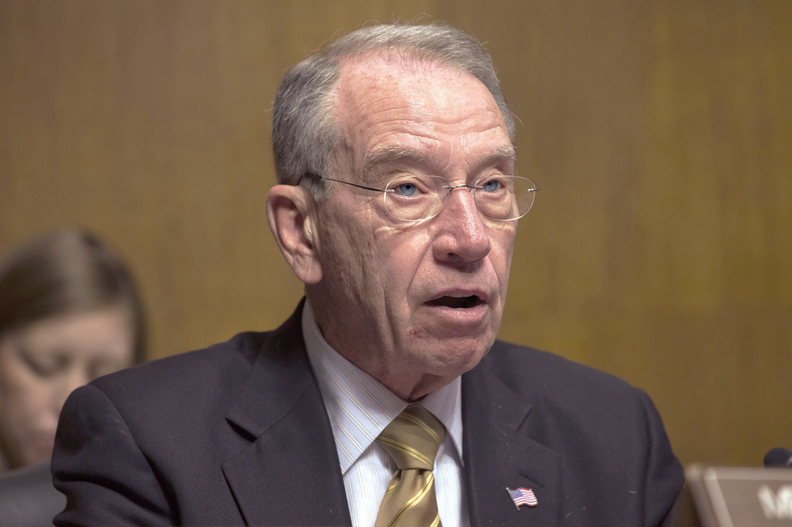 "Making sure that tax-exempt hospitals abide by their community benefit standards is a very important issue for me," Grassley wrote. "As chairman of the Senate Judiciary Committee, I oversaw an investigation into the billing practices of the Mosaic Life Care hospital. That investigation resulted in debt relief of almost $17 million for thousands of low-income patients. This issue is still just as important to me now that I am chairman of the Senate Finance Committee." Grassley conducted an investigation into that Missouri provider after a 2014 report by National Public Radio and ProPublica found the hospital had garnished patients' wages in their effort to recover debt. Even before he assumed the top post with the Finance Committee, Grassley last year maintained a stream of correspondence with IRS officials hammering the same issue. He also probed Michael Desmond, now chief counsel for the IRS, on the issue during Desmond's Senate confirmation hearing. As Finance chair, Grassley has now designated several staff members to receive briefings on the agency's findings. In last week's letter, he tasked the IRS with a report to the committee by April 1 on the full scope and findings of the tax-exempt hospital audits. The probe is part of a broader oversight effort on hospitals. Earlier this month, Grassley told reporters he plans to include providers in his watchdog agenda, following his efforts with drugmakers to bring transparency to their prices. His hospital plan "would still involve the same transparency" he wants to bring to manufacturers, he said. To start, he wants to make sure hospitals are complying with the Trump administration's new requirement for providers to publish their chargemaster prices. "We already have rules in place starting right now this year, where they got to put their prices out there, so one of our oversight responsibilities will be to police that they're doing it right," Grassley said. Modern Healthcare's analysis of community benefit spending in one state, Illinois, showed around 9.1% of the hospitals' total expenses were dedicated to community benefit programs in 2013, compared with 8.2% in 2016, though not all hospitals had reported for 2016 at the time of the analysis. Percentages for individual hospitals ranged from 0% to 28.6%. The Medicaid shortfall, or the gap between Medicaid payments and the hospital's estimated cost for those services typically calculated by its cost-to-charge ratio, increased from 31.4% of a hospital's total community benefit spending in 2013 to 41.1% in 2016. Charity care, or free or subsidized services provided for the uninsured or under-insured, fell from 29.7% of overall community benefit calculations in 2013 to 17.7% in 2016.